Tuesday September 4th 1883 I got the ironing done and the house cleaned up before noon. I was in town all the afternoon. I got a little trading done. I did not come home till supper time. Mother had been drying corn all afternoon. Wednesday September 5th 1883 Lee, Arch and Father all went to the State fair this morning. I was busy all the forenoon fixing some pillows and changing things about up stairs Late in the afternoon went over to Hatts and Rob was there to supper too. We spent the evening out at Prof Philbricks. 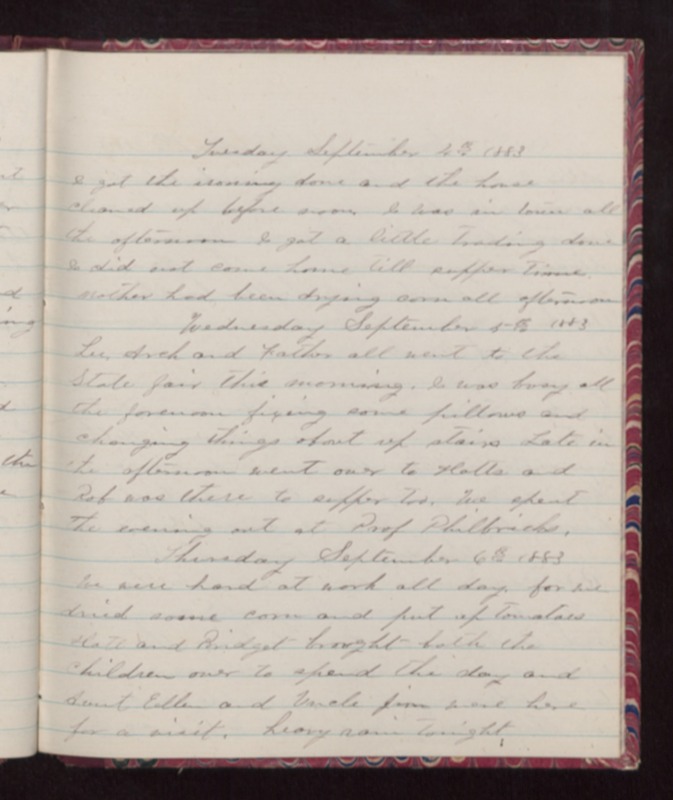 Thursday September 6th 1883 We were hard at work all day, for we dried some corn and put up tomatoes Hatt and Bridget brought both the children over to spend the day and Aunt Ellen and Uncle Jim were here for a visit. heavy rain tonight.